Some may recall the 'futuristic view' of the Antichrist as was promoted by the Vatican Jesuits of centuries past as a way to get the people to look away from the Vatican and to a future Antichrist would would appear near the end that would attack the Christians. It is obvious that Rome created Islam and even wrote their Koran knowing they would one day use that futuristic view to their advantage so as to pull the onus off of them. There's a book that came out some recently that I was watching for a few months to see if it became popular among false teachers in the coming months. It appears it has done just that. Since September 11, 2001 there have been some preachers and teachers, as well as numerous websites and media moguls declaring the Islamic leaders, and especially their so called Muslim Mahdi that Islam declares is on his way, are in fact the Biblical Antichrist. At first it was mostly offhanded remarks on pulpits or at water coolers for a few years. 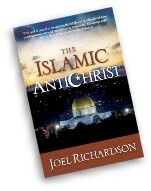 But then World Net Daily started to push that book written by Joel Richardson titled "The Islamic Antichrist" that feeds off those rumors. But is this so? Is Islam the prophesied Antichrist? Do the prophecies in the Christian Bible really line up with the assumption that the Antichrist is from Islam? And is there historic evidence to support a claim such as this? Being Berean's of the Word and students of prophecy we know that the only way to find this out is to actually go into our Bibles, study the prophecies that speak of the Antichrist, and then look in our history books to see if in fact Islam did what the prophecies say the Antichrist will do. If Islam truly is Antichrist, then we need to declare it across the land so as to warn the people. But if Islam isn't the home of the Antichrist, then according to the Word of God, that has been trusted for 6000 years, we need to find out who really is responsible for fulfilling all these prophecies. There are literally hundreds of prophecies found in the trusted Word of God that describe the Antichrist and his agenda quite nicely. Our God is not one to leave His children in confusion on such an important matter such as this. One of the nice things about prophecy is how the Lord allows it to be hidden by most until the event is fulfilled. That way it can build a better foundation of truth on which to build within the hearts that come to see it. After all, Jesus did say in John 14:29, "And now I have told you before it come to pass, that, when it is come to pass, ye might believe." On my website I have a growing list of prophecies that at present are 26 in number. Yes, as I stated a moment ago there are hundreds of prophecies that expose the enemy of our God and His people. But on that particular page I prefer to share the more bold prophecies that many people have either heard of, but never found the time to research them out, or they are in themselves rather easy to describe using both Scripture and historic record. If you are one to frequent the site over the years you will know that I cover many of the prophecies in numerous different pages all throughout the site. Some, like the mark of the beast I prefer to share on a page all its own as that topic must be studied a bit more in depth so as to allow for no doubt to well up in the heart. In any event, out of the 26 prophecies on my "Characteristics of Antichrist" page, I would like to outline in a few moments 14 of them very briefly so as to remove all doubt as to who the Antichrist is. Of course, you can go to that page on the site to look into the Scriptural statements as well as historic record to verify each prophecy. Absolutely every prophecy found in the Word of God that touches on Antichrist must match with that person leading the one organization in the world that works directly with Satan or we will find we have stumbled off the path of truth. For example, you cannot have a few prophecies declare someone or some organization to be home to Antichrist while ignoring the others that point somewhere else. If we are to be trusted by those seeking the truth on this, we need to be exemplary in this message so as to prevent doubt from being a key factor in their denial. For example, take the number 666 wherein the prophecy specifically says is the number of a man's name in the book of Revelation. Many people have used this 666 to declare Ronald Reagan, Muhammad, or even Microsoft Windows are "the Antichrist" because they can place numeric values to these names that cause them add up to 666. Some will even go so far as to purposely misspell a person's name, or use their name in a different language to make the 666 appear valid. Many loyal Catholics who simply don't know their priests are lying to them do this with the name Ellen White because this woman was known for her ability to point out prophecies and historic facts that exposed the Popes in the mid 1800's. They found her name did not equal 666. It fell short by 10. So they decided to use to letter V's to create the "W" for her last name. The letter V equals 5 in Roman numerals and two of them gave them the additional 10 count they needed. Thing is, even if their calculation of 666 may be true for Reagan, Muhammad, Windows or White, it holds no water when it stands alone. What I mean is, their names may very well add up to 666, but do all the other prophecies regarding the Antichrist find fulfillment in their lives as well? Truth is, this is why the elect cannot be deceived in the last days. Being students of prophecy, we know how to decipher as well as how to properly share the prophecies without hiding certain Scriptural facts under a rug when they prove we are in error. All too often false teachers and preachers get themselves in a trick bag by doing this. Nice thing is however, this makes for an easy way to expose them when the light of truth is allowed to shine, which in turn helps to bring a cherished soul out of their deception and eternal danger. As Christians we worship a perfect God who's prophecies are always 100% intact and accurate to the very last letter. That being said, what does the Christian Bible say about the Antichrist? Is it Islam as the media is now reporting? Or did someone else fulfill these prophecies? Keep in mind. The list of 14 fulfillments that I am about to share is just a brief summary of each prophetic event I cover in my book, "Characteristics of Antichrist," which is completely free to download on this website. Each prophetic fact, and all that entails each fulfillment is discussed in detail in my book along with all the Scriptures and historic facts, as well as their sources so as to erase all doubt as to what the Word of God says on all this. In fact, if you read just a few of the prophetic facts you will find how easy it is to put to rest the lie that is being proclaimed in the world regarding Islam being the prophesied end time Antichrist. And no, I am not defending Islam in any way shape or form here. It is a very evil religion invented by the one who really is the Antichrist so as to hide his true agenda. It may seem complicated or even somewhat similar to a sinister spy novel, but as most have experienced in life, truth usually is stranger than fiction. And quite often, this is exactly how Satan is able to pull the wool over the eyes of so many by making them feel that some things are just too difficult to believe. What I am about to share are 14 prophesied acts found in Scripture to have been fulfilled by only the one called Antichrist. That being said, is Islam really the Antichrist? Did Islam destroy 3 nations exactly 1260 years before being mortally wounded politically? No. But the Vatican did that in 538AD when it annihilated the Vandals, Herulis, and Ostrogoth and exactly 1260 years later lost its political power in 1798AD when Napoleon removed the Pope from power. Did the ancient Roman leaders give Islam their power to become a Universal church and Political State? No they did not. But when Rome was crumbling to pieces they did decide to mix the now Paganized Christian Church with the State so as to regain control over the people. This mixing of the Church & State power was eventually known as Vatican City. Does Islam have a figurative perpetual “leader” who has over a dozen titles that all = 666 individually? No, only the popes have been elected by succession at the death of each preceding Pope who then must bear the exact same titles for the office of Pope that when spelled in Latin, which is also Roman Numerals equals 666 for title they hold. Does Islam reside on 7 hills? No, the Vatican does and is unofficially called by most prelates and members of the modern day media as well as thousands of religious and secular authors as "The City on Seven Hills. Was Islam wounded politically exactly 1260 years of receiving its power from Rome after killing hundreds of millions of Christians and then later resurrected to regain power globally? No, but the Vatican was politically destroyed by Napoleon in the exact year of 1798AD, and the politically "resurrected" in 1929 when Cardinal Gasspari and prime minister Benito Mussolini signed the historic Roman pact in the Lateran Palace officially granting the Vatican its Church & State power once again. Does Islam have a leader claiming to be a god on earth? No, but the popes has stated many times in writing that they are a "god on earth." Does Islam claim to have the power to forgive sins of men? No. But the Vatican invented a doctrine of reconciliation wherein they claim the priests can forgive the sins of men. Does Islam preach another version of Jesus to Christians as their main mission in life? No, but the Vatican has been documented as doing so for almost 2000 years now. Did Islam kill over 500 million Christians during a 1260 year period? No. But the Vatican did exactly that from 538AD to 1798AD. In fact, Pope John Paul II admitted that as fact in his globally broadcast mea culpa of March 12, 2000. Do all the politicians of the world clamor to please Islam to better their political careers? No. But every politician in public agreement with the Pope has been granted powerful positions in life. The most recent being Ronald Reagan, Both Bush's, William Jefferson Clinton, Tony Blair, and Barack Hussein Obama. Does Islam mix Paganism in all it’s forms with Christianity? No, but not only has the Vatican done so, they have admitted doing so in writing. Does Islam force all the world's kings to bow to him in worship? no. But every Pope demands lesser political leaders bow before him to kiss his ring on camera. The more prominent ones like US presidents and the like are required to do so behind closed doors due to the American Constitution demanding a separation of Church & State. Will Islam have a leader that is homosexual in nature? No, but many Popes, the majority of the Cardinals, Bishops and priests are homosexuals. In fact, back in the year 2000 it was discovered that Roman Catholic prelates were dying of AIDS 11 times greater than anyone else. Plus, their doctrine of celibacy confirms they are exactly as the prophet Daniel predicted in this respect. Did Islam change the Sabbath of the Creator God from the 7th day to the 1st day of the week wherein all Christians churches, except the Remnant church agree on? no. But the Vatican admits to doing just that in writing. Click here if you need to see these facts and more in detail. Click here for a short video outlining 11 of these prophecies. Click here to download or read the book "Characteristics of Antichrist." So there you have it. Islam cannot possibly be the Antichrist. The Popes of Rome have fulfilled each and every prophecy that has ever been uttered by our God that describes the Antichrist in such graphic detail that only those that hate the Scripture, or deny Historic record will deny. But because the churches no longer teach prophecy, and the media is under their thumb to prevent such things from being mentioned to the people enmasse, their ignorance spreads just as prophecy predicted and mostly because the people in the churches prefer it that way. After all, was it not prophesied in Isaiah 30:9-10, "That this is a rebellious people, lying children, children that will not hear the law of the LORD: Which say to the seers, See not; and to the prophets, Prophesy not unto us right things, speak unto us smooth things, prophesy deceits:"
I know of this first hand only because I was shut down on the Radio for preaching such things more than one time and for those recall the days before we had our own online church conference server we would have our church meetings hacked and attacked. This is why the Lord blessed us with our own radio station at WTPR online years ago as well as the poGm conference server back in 2004. Due to global censoring in the media, the sanatization of historic records, and even the martyrdom of some vocal men and women of God over the years, most are unaware of the facts regarding the man of sin in Rome. Still, the Lord's bride will go forth and thanks to that prophesied fact stated in 2 Thessalonians 2:3, "...that day shall not come, except there come a falling away first, and that man of sin be revealed, the son of perdition;" Look around, not only has that fallen away been visible for decades, so has that man of sin in Rome. Yes, Islam is evil, and they do Antichristian acts on a daily basis all around the world. But so do most politicians, preachers, teachers, and even some next door neighbors. But in order to claim the infamous title of "Antichrist" they must fulfill 100% of each and every single prophecy uttered by the God of creation. Islam simply cannot do that no matter how much you stretch, or twist the truth about the Antichrist. When they declare Islam to be "the" Antichrist they can only do so by purposely leaving out certain prophetic events, and use some that just about anyone can fulfill to make Islam appear to be the prophesied Antichrist. But if you're a student of prophecy, and one who has seen these prophetic facts matched in historic record, you will see that only the Roman Catholic Popes fulfill each and every prophecy with 100% accuracy. So.. why are they lying? I you're one to watch current events, especially on a global scale, you will notice that the media, the preachers, and Rome itself are right now declaring Islam to be Antichrist. And this has happened quite suddenly in fact. They do so for the very same reason Hitler was called evil in his day. Back when Hitler was in power, Rome, and those under her thumb needed to hide what the Pope was doing to the Jews as well as Sabbath keeping Christians. No one would doubt that Hitler was an evil man. But what most failed to realize was, he was just following orders from the Vatican to kill the Jews and any Sabbath keeping Christians he could get his hands on. Rome specifically placed Hitler in power for the sole purpose of killing those people. Rome has always used others to do their dirty work throughout the centuries so they can hide behind their so called "Christian" moral front. I am sure millions of molested children would declare boldly they are anything but Christian. Still, to the untrained eye, Rome appears to be a church, and a holy one at that. The prophet Daniel was very adamant about illustrating just how crafty the Popes would be when he penned as much as he did about them long ago in his prophecy regarding the Little Horn in Daniel chapters seven and eight. Daniel knew they would be able to pull the wool over the eyes of literally billions because the Lord told him so. And so the Lord allowed Daniel to expose them long before they were even born, so as to bless us later on when Daniel's book would be opened as we see prophesied in Revelation chapter ten. Prophecy also predicted in Revelation 13:3 that all the world will wonder after this beast. And so it has. On the other hand, with Islam, we now have an easy method by which to expose Rome's hand. Not only do we see Rome benefiting by every political move Islam makes. Especially in regards to all the new constitutions being penned that allow for Roman demands to be sanctioned in each country just as they did in the European Union not too long ago. Documented evidence has recently been unearthed that proves hands down the Roman Catholic church actually invented the religion of Islam hundreds of years ago under the direct guidance of Satan himself to do exactly as they're doing right now. Click here for that proof. After all, it was prophesied long ago that right before the end of all things on earth, God's people would know who the Antichrist is. And so we do! We now know Rome used Hitler behind closed doors to get the job done. With this well documented historic knowledge compiled with that which Daniel 11:13-45 confirms, we have grown to understand this is how they work. Now do you see why everyone is declaring Islam to be the Antichrist? Just as Rome used Hitler to hide their evil deeds in plain sight by having Hitler play the fall guy, they are now using Islam to do the very same thing. Rome will do what prophecy said they will do without most people seeing it because everyone is following Rome's lead by keeping their eyes on Islam instead of looking in Scripture to see how Daniel predicted their crafty methods to deceive. That is how Rome came to power in its infancy, that is how they infiltrated all churches and nations over the centuries, and that is how prophecy says they will be able to rule the world behind closed doors in the last days. Is Islam an Antichrist organization? Yes, very much so. As of 2010 statistics, they are killing an obedient even unto death Christian for their faith every 2.6 minutes around the world. That number has of course increased since February of 2010. But the powers that be aren't allowing those figures to be made public so as to allow the bloodshed to continue. So again, yes, Islam is antichristian. But they are not THE Antichrist as outlined in the prophetic Word. The historic facts simply don't bear that out. As many of you know that frequent this website, I now (as of 04-28-13) have well over 10000 pages of facts proving the Roman Catholic prelates to be the prophesied Antichrist. I even have quotes from every single main stream denomination on the planet over the last 1000 years or so stating the Popes of Rome to be Antichrist listed on my "they called him Antichrist" page of the website. Strangely enough however, on that same page you will find quotes Catholic Bishops as well as from two different Popes also declaring the Pope to be Antichrist. It seems during John Wycliffe's day the church experienced a schism and two Popes assumed the throne and each one was calling the other Antichrist. What they failed to realize was, they were both right. Many of you hearing this on the radio, watching this in the video that's based on this sermon, or just plain reading this in a tract or on my Islamic Antichrist page, you are no doubt from those many different denominations listed online that have declared the Pope to be Antichrist. But now, your leaders declare him a man of God. Are you aware that when they do that your pastors are actually declaring the Bible prophecies that match perfectly with historic record to be a lie by proclaiming Islam is Antichrist? Sad thing is, since they joined with the Vatican on June 26, 2000 when the United Religions Initiative was ratified making the Pope their spiritual leader, they had no choice but to declare Islam Antichrist. If they refuse to do so and the Pope gets wind of it, they will lose their benefit enriched membership within the World Wide Council of Churches. Seeing how they are more apt to protect the money than the flock, they will do as he commands. Another sad fact is, those of you staying in these churches are also illustrating to all students of prophecy with eyes that see that you and your church leaders are the very ones Jesus spoke of when He declared there will be the false teachers, preachers, prophets and lay people that would come into the world right before His return! That fact alone will hopefully grant you the wisdom to "Come out of her, my people, that ye be not partakers of her sins, and that ye receive not of her plagues." -Revelation 18:4.